I just wasn’t ready for the night to be over. J and I headed back to the hotel pretty early after the wedding reception at The Grand Ballroom at Joliet Union Station. She was exhausted and ready for bed. L was actually with my parents in a room down the hall, unbeknownst to us, fast asleep. J wanted me to go get her and bring her back to our room, but I was hungry. I decided to go grab something to eat before getting L from Grandma and Papa. I spent my college years in Joliet, so I kind of wanted to look around a little while we were there. It’s been eleven years since I graduated from college and there’s not much in Joliet that looks familiar to me. The one thing that did look familiar was the corner of Larkin and Jefferson Streets. I know there are a lot of you shaking your heads right now knowing about my hatred of onions. I have to admit, I’m a little surprised myself. I was starting to get tired and I didn’t want to go to a bar by myself, so I gave in and went with the slider. The Joliet location of the Ohio based fast food franchise. Growing up, and even when I lived in Peoria, this location in Joliet was the furthest south in Chicagoland. 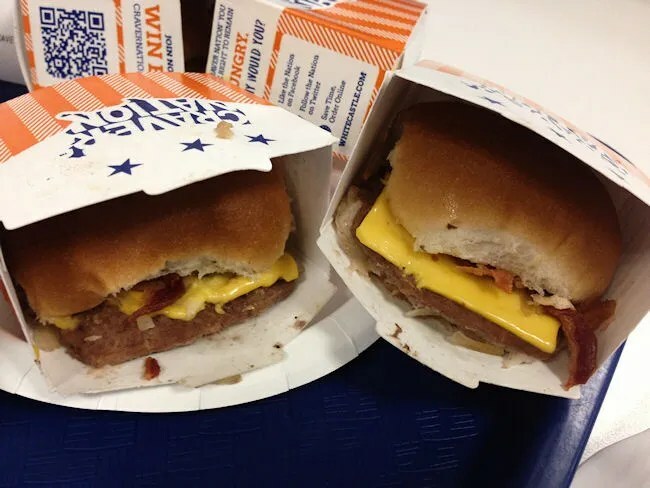 A lot of my friends used to make road trips (a la Harold and Kumar minus the weed) just to pick up a huge pack of sliders. 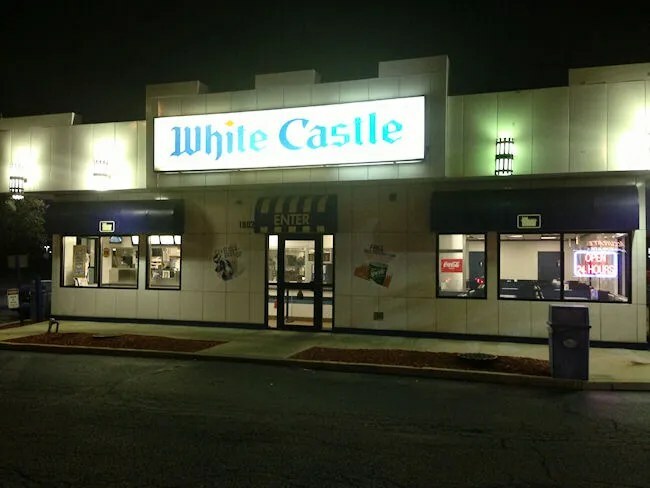 To be completely honest, I’m not sure I’ve actually ever been inside a White Castle before. The few times I have been, I usually went through the drive through. 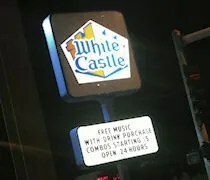 I don’t know if all White Castle’s are like this, but the set up seemed somewhat odd. The grill is kind of up front and center in the restaurant. There is glass separating the dining room from the kitchen and on the end of the opening, there is a single cash register. The menu board hangs above and in front of the cash register, so there’s really only a small opening in to the kitchen area where you order. I scanned the menu real quick not really knowing what I wanted. I didn’t need a whole Crave Pack, so I just ordered four Bacon Cheeseburger Sliders and an order of Loaded Fries. I passed on the drink because they had Coke and there was a gas station next door that I was going to have to stop at any way. The bill was a little over eight bucks for the four sandwiches and fries and about the time I sat down in one of the booths, my name was being called and I was handed a tray of greasy boxes filled with the famously craveable sandwiches. I still wanted to kill a little time before getting the baby from my parents so I sat down and started in on the fries. 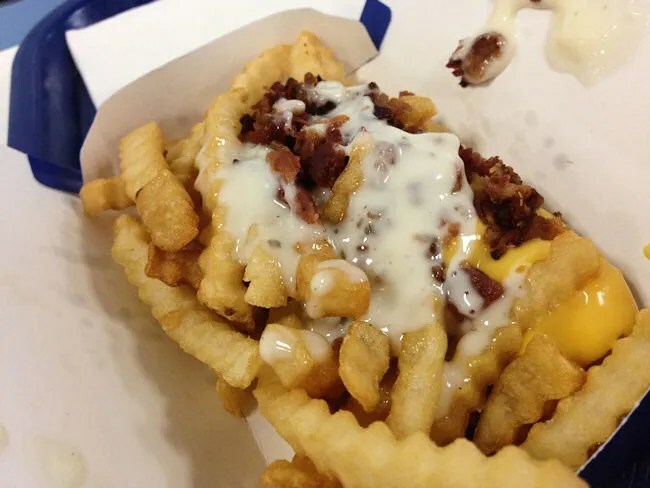 The crinkle cut fries were topped with liquid cheese, sour cream, and bacon bits. It’s exactly what you’d expect from a fast food joint. Not to-die-for fries by any means, but just good enough to make you want more when they’re gone. The burgers…where do I start. For someone that doesn’t like onions, this is out of character. I didn’t even bother asking them to keep the onions off. The burgers are cooked on a bed of onions, so the flavor isn’t going away. Once I got the small burgers, I pulled the soft, steamed bun off and used the fork from my fries to sort of slide off the big chunks. It turned not to be as big of a deal as I thought it would be. Once the bulk of the onions were gone, I was left with four, super thin burgers, cheese, a small slice of bacon, and a pickle on a steamed bun. There’s a whole method to cooking the frozen, square patties on a bed of rehydrated onions with the bun bottom on top of them that I’m sure everyone has seen on some kind of food documentary show on TV. The four sliders were just about perfect to feed that late night craving although I don’t quite understand the fanatics that will drive hundreds of miles just to get them. They were fine and if there was one right down the street, I’d probably slip it in to my late night rotation, but otherwise, it’s just another fast food place as far as I’m concerned.